There’s still spots remaining for all four action-packed JM Motorsport Productions’ Demolition Derby shows at the 2016 Erie County Fair. 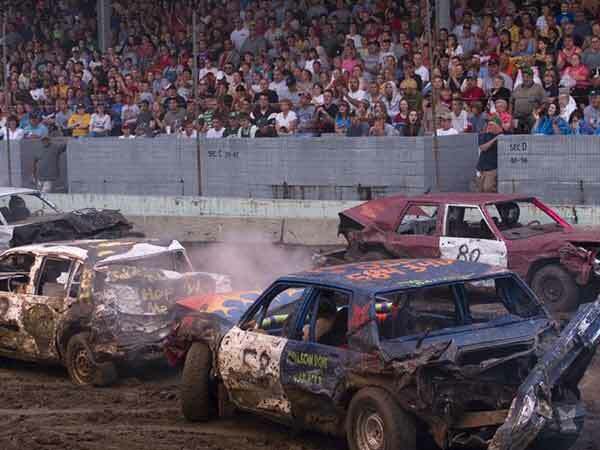 Wednesday, August 17th (7:30pm) is the annual “Night of Destruction”; featuring the Big Bus Demolition Derby, Mini Van Demolition Derby and Double Figure 8 Racing. Saturday, August 20th has shows at both 1:00 and 6:00pm, featuring both the Demolition Derby and Modified Team Rivals Demolition Derby at each, with the 4-cylinder Compact Demolition Derby during the afternoon. Sunday, August 21st at 3:00pm is the Statewide Demolition Derby Championship, where State Champions are crowned in the 4, 6 and 8 Cylinder Classes, as well as Championship Figure 8 Racing. ALSO, for the first year ever you can pre-register directly online. Just go to http://jmderby.com/schedule-of-events-for-2016/, scroll down the events at the Erie County Fair and find the event you’d like to pre-register for. If you have any further questions, give JM Motorsport Productions a call at (716) 980-6533.